8/5/2008Share this story on Facebook! See Marian Brown Quoted in USA Today! Taste testers were given three samples of water, marked only as X, Y, and Z. They were asked to rate the taste of the water without knowing whether it was from a bottle or a tap. The tastings took place on IC's campus and around the Ithaca area, in spots like the Ithaca Farmer's Market. In four out of the five tests, the tasters actually preferred the tap water. 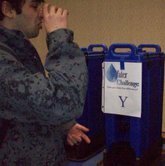 Ithaca College and the Town of Ithaca have access to great tasting tap water. The study was meant to highlight the palatability of Ithaca’s tap water and encourage IC students and Ithacans to take advantage it. There are many reasons that bottled water has become a trend of the 21st century, and most of them have nothing to do with necessity. As large companies use their advertising dollars to push bottled water, the huge campaigns they've launched have doubtlessly affected American consumers. The sale of bottled water has quadrupled in the last 20 years. As the clear plastic bottles become more ubiquitous, their impact on our environment becomes greater. “No water is ever completely free of chemical contaminants, except for distilled water, and most folks would hate the taste of that, because one's palate actually tends to prefer certain natural chemicals in water like calcium, and other minerals,” explains Brown. Though many people might grab a bottle of water because they think it's safer than drinking from the tap, city water actually passes through rigorous testing and must meet FDA standards, which usually follow the recommendations of the EPA. “In terms of water quality safety issues and open disclosure of chemicals in the water product, the best option is to choose municipal water sources,” says Brown.